Vaughan, Ontario, Canada — Motion Control Components — The DMC-40×0 motion controller is Galil’s highest performance, stand-alone motion controller. It belongs to Galil’s latest generation motion controller family, which accepts encoder inputs up to 22 MHz, provides servo update rates as high as 32 kHz, and processes commands as fast as 40 microseconds-10 times the speed of prior generation controllers. 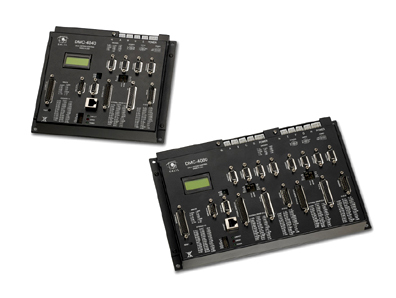 The DMC-40×0 is a full-featured motion controller packaged with optional multi-axis drives in a compact, metal enclosure. The unit operates stand-alone or interfaces to a PC with Ethernet 10/100Base-T or RS232. The controller includes optically isolated I/O, high-power outputs capable of driving brakes or relays, and analog inputs for interfacing to analog sensors. The DMC-40×0 controller and drive unit accepts power from a single 20-80 VDC source..
« Motion Control – Match One of These Compact 1.0 Inch Diameter Voice Coil Motors to Your Application’s Stroke Requirements!